Once attending the annual Eckhart conference in Oxford, I listened to a compelling talk by Ayya Khema - a German Jewish woman who at the age of forty eight had been ordained as a Buddhist nun in Sri Lanka. It was compelling, firstly, because of her presence - calm, poised, kindly with an edge of appropriate detachment and discipline; and, secondly, because she imparted simply the most useful advice on meditation I have ever received (to date) - on how to deal with distraction. This was to compile a simple vocabulary that provided a classifying order for your distractions and when you found yourself distracted, as I often do, simply draw on the word list for the most appropriate one, gently name the distraction, and return to your point of focus. It works, mostly beautifully, and I have been grateful ever since. In reading her autobiography this week, mostly on an aeroplane, I realized the remarkable life that had given birth to her presence. Remarkable both for the diversity of its experience and, at another level, it's touching of all our ordinariness (for good and ill). A refugee from Nazi Germany, who have been evacuated to Scotland on a 'kinder train', she rejoins her parents in Shanghai just in time for it to fall into the hands of the Japanese. Her skills as a typist are what keeps her, and her parents, afloat. Emigrating to America, she passes through a suburban life of marriage and children, a divorce, a second husband, a life of adventurous travel that includes engagement on a project to build a power station in Pakistan, that comes to 'rest' in Australia and the ownership of a farm. But all through this is a slow, steady tugging of Blake's golden string, pulling her towards yet something other, deeper, more meaningful. She takes up meditation (initially taught her by the Mother at Sri Aurobindo's ashram in Pondicherry) before (in Australia) being drawn into Buddhism (in the Theravada tradition). 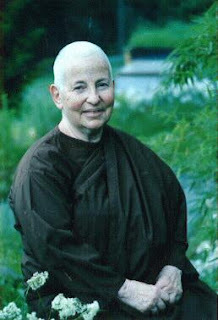 Another separation from her second husband leads to the freedom necessary to pursue a monastic vocation (in Sri Lanka and, finally, to spreading the dhamma in the West from her native Germany). It is all told with a simplicity and insight that is moving, most especially because nothing is felt to be hidden and it is enfolded in a growing sense of loving non-attachment and freedom. It was narrated, as it happens, as she approached her own death, and in knowing the reality of the cancer that would finally kill her, and you sense throughout the presence of a good death coming to greet her. I am left wishing that my encounter had not been the only one; and, yet reminded that even once we can be touched or touch in a way that is lasting; and, in each and every encounter, we have that choice. Making the most of that choice needs a continual practice and deepening of awareness - a making that Ayya Khema dwelt in abundance.